Home » video » How to Import AVI to Premiere Pro CS5/CS4/CS3 for Mac or Windows? How to Import AVI to Premiere Pro CS5/CS4/CS3 for Mac or Windows? This article will explain why we often failed to import AVI to Premiere as well as introduce a step by step guide on how to successfully import all kinds of AVI files to Adobe Premiere, Adobe Premiere Pro, Adobe Premiere Pro CS3/ CS4/ CS5. Why We often Encounter Problem in Importing AVI to Premiere Pro? According to Adobe official website, Adobe Premiere Pro does import AVI files. However it only imports DV-AVI. If you try to add other AVI files like DivX-AVI, MJPEG-AVI, Xvid-AVI, 3ivX-AVI and more to Premiere, it either ends in fail or encounters some audio or video problem. Unsupported AVI video often comes from Sony camera, Canon camera, Nikon camera, Carton videos, and downloaded websites. How to Successfully Import AVI into Premiere? In order to import AVI to Premiere successfully, we need to convert the unsupported AVI to Adobe Premiere Pro more compatible video format like MPEG-2. 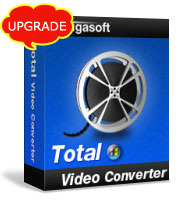 Bigasoft Total Video Converter is just the ideal AVI to MPEG-2 conversion software. It can easily convert any kind of AVI video to Premiere supported MPEG-2 format for adding AVI to Adobe Premiere, Adobe Premiere Pro, Adobe Premiere Pro CS3/ CS4/ CS5. Besides, this powerful AVI to MPEG-2 converter can also convert AVI to other Premiere supported video formats including WMV, VOB, ASF, GIF and more. Moreover, it even can convert 3GP, FLV, MTS, MKV, MOV, RM, RMVB, TS, MP4, WTV, MVI, and more to Adobe Premiere compatible video format. The following is a step by step tutorial on how to convert AVI to MPEG-2 for importing AVI to Adobe Premiere Pro CS5/CS4/CS3 with the help of Bigasoft Total Video Converter. Free download the professional AVI to Adobe Rremiere Converter - Bigasoft Total Video Converter (Windows Version, Mac Version), install and Run it, the following interface will pop up. Click "Add File" button to to import AVI video file. 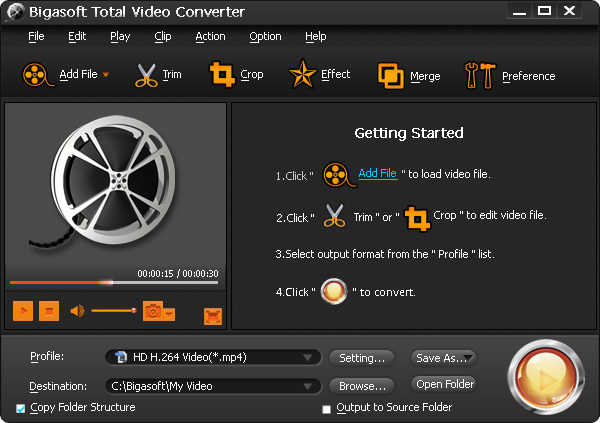 Or you can also drag and drop your AVI file directly to the main interface of Bigasoft Total Video Converter. Click the drop-down button on the right side of the "Profile" button to select MPEG2 video(*.mpg) from the "General Video" Category. Click "Convert" button to finish converting AVI to Premiere compatible MPEG-2 video format. First start Adobe Premiere, then select File > Import from the main menu to add the converted AVI to Premiere Pro project. It is just easy to import AVI files to Adobe Premiere Pro CS3/CS4/CS5 as soon as you get this powerful AVI to Premiere converter. Why not to have a free try right now?